TRADING COMMODITY FUTURES AND OPTIONS INVOLVES SUBSTANTIAL RISK OF LOSS AND IS NOT SUITABLE FOR ALL INVESTORS. YOU SHOULD CAREFULLY CONSIDER WHETHER TRADING IS SUITABLE FOR YOU IN LIGHT OF YOUR CIRCUMSTANCES, KNOWLEDGE AND FINANCIAL RESOURCES. This article will focus on the COMEX/GLOBEX SILVER FUTURES trend in the short, mid, and long term from a technical view. Technically, I see the COMEX/GLOBEX SILVER FUTURESmarket still in aSUPER-TREND higher as the market trades above both the 9 daySIMPLE MOVING AVERAGE and the 20 day SIMPLE MOVING AVERAGEas the indicators point higher. Back on February 6th the SILVER market had a high of 33.87 per ounce and a low of 32.99 per ounce. That was the first time that the market traded below the 9 day SIMPLE MOVING AVERAGE since the SUPER-TREND up began back around January 23rd. Note that that each bar represents a day on a daily chart. January 23rd was just a couple of days after the cross on this daily chart when the 9 day SMA crossed over the 20 day SMA. After the cross I wait for the 20 to start pointing upward along with the 9 AND then I get the buy signal. See daily chart below. 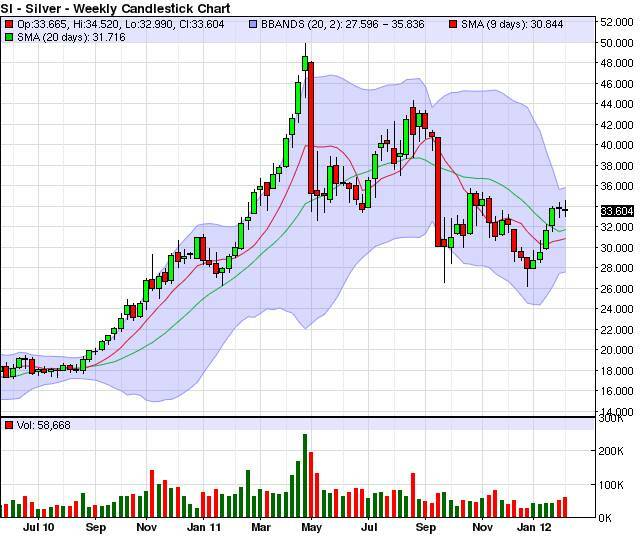 Technically, I see the weekly COMEX SILVER chart not giving much of a signal at this time. On a weekly chart each bar represents one week. This market gave a beautiful sell signal in my opinion on November 14th when the 9 period SIMPLE MOVING AVERAGE crossed under the 20 period SIMPLE MOVING AVERAGE and the market traded below both SMA's. The SUPER-TREND lower on this weekly SILVER chart started when we got the cross on October 10th when the 9 period SMA crossed under the 20 period SMA. From that point, both SMA's where pointing lower on fairly steep angles and the COMEX SILVER market traded below or right at those SMA's. Then the trend changed approximately three weeks ago in my opinion, as the market rallied above first the 9 period SMA (the red line) and then the 20 period SMA (the green line). Now we have rallied and held above both the indicators. Also, the 9 and 20 period SMA'S are now moving in a sideways or horizontal direction. 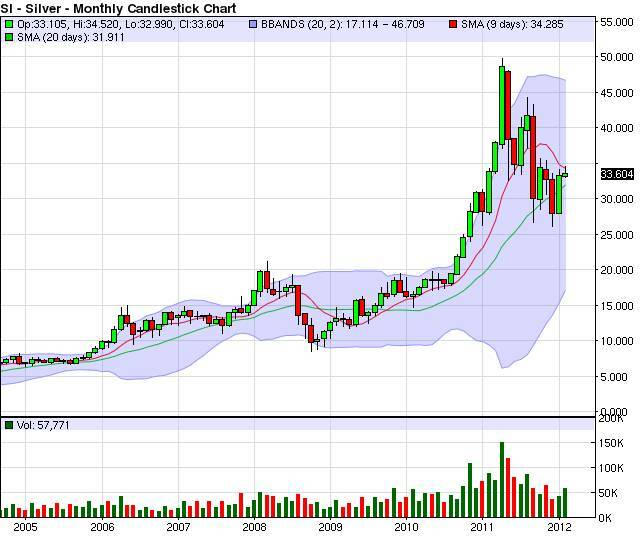 See weekly chart below. Technically, the COMEX SILVER on this monthly chart is in an upward trend according to my indicators, because the market is holding at or above the 20 period SIMPLE MOVING AVERAGE (the green line), as the SMA points up on a pretty sharp angle. The reason that the monthly COMEX SILVER chart is not in a SUPER-TREND higher is because of the red line, the 9 period SIMPLE MOVING AVERAGE. That SMA is now pointing lower, because of the collapse in September when SILVER prices fell from a high of 43.35 per ounce to a low of 26.58 per ounce, which is approximately a $16 move from the high to the low. My definition of a "SUPER-TREND" up is when the 9 period SMA has crossed over and is above the 20 period SMA as the two SMA's point upward on fairly steep angles AND the market trades above not only The 20 period SMA, but above the 9 as well. However, we are still holding the upward trend as prices seem to hold at the 9 period SMA (green line), while it still points up on a step angle. If the COMEX SILVER market doesn't hold here or go higher, then the next area of support, in my opinion, in the LONG-TERM is the bottom BOLLINGER BAND at about 17.11 per ounce. 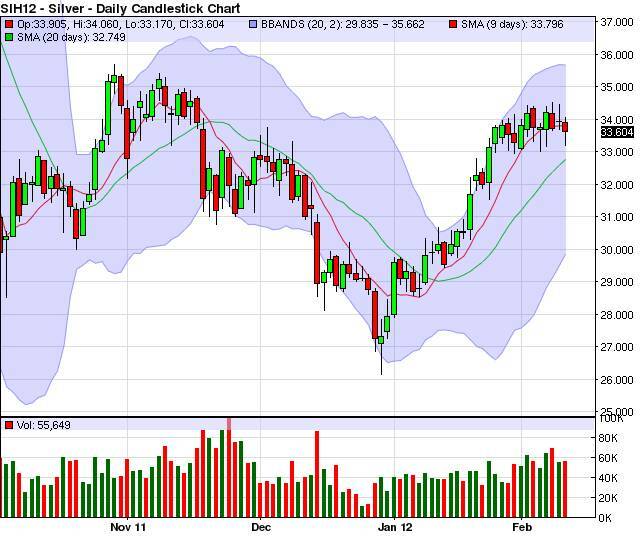 A potential play here could be to buy May Silver Bull Call Spreads or May Calls. Another potential play could be to sell deep out of the money puts to collect premium. Either play does involve substantial risk and is not suitable for everyone. When we buy Call Spreads or Calls we also buy in a 3 to 1 ratio, a Put to help protect us against a MAJOR correction in the market. For the details on strike prices, expiration dates, size, and exact risk please contact me at mmckinney@zaner.com or phone me direct at 312-277-0115. I am an option specialist so these trade ideas are not really designed for futures, but I would still be happy to talk about futures. Futures, options and forex trading is speculative in nature and involves substantial risk of loss. All known news and events have already been factored into the price of the underlying commodities discussed. The limited risk characteristic of options refers to long options only; and refers to the amount of the loss, which is defined as premium paid on the option(s) plus commissions.